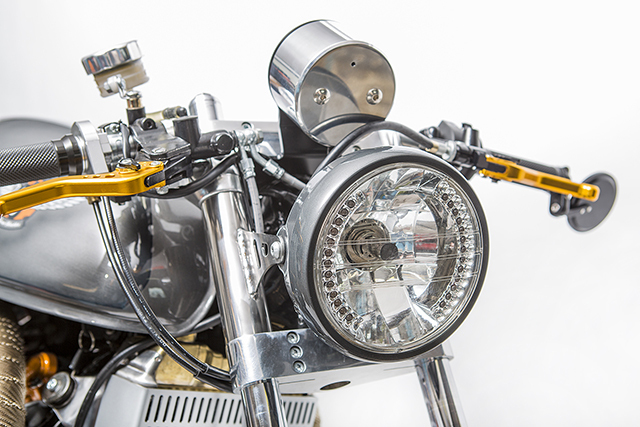 There is a lot to be said about picking a model of motorcycle to customise that is already popular in the industry. Parts are readily available, there is a wealth of knowledge on what does and doesn’t work and plenty of inspiration to be drawn from other builds. The problem comes, when if like Wena Customs of Poland, you pick such a bike and hope to not only stand out from the crowd but win trophies too. 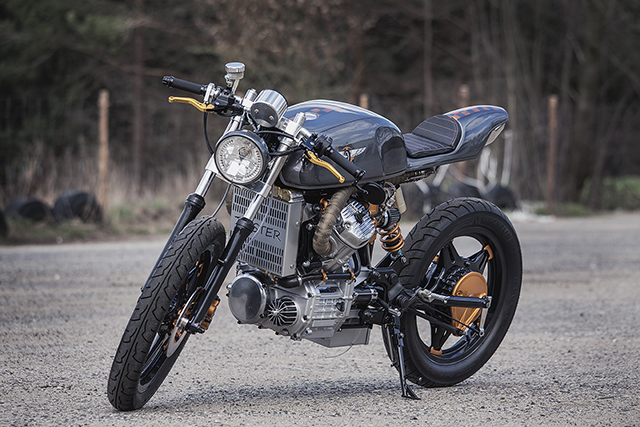 But their 1980 Honda CX500 is positive proof they can take a popular machine and build a bike so good that judges at the Poznan International Motor Show awarded them the prize for best cafe racer. Even more impressive is that the Wena Customs journey only began two short years ago, but the team brings together a wealth of knowledge that means this Honda has the go to match the show. When Andrzej needed someone to come on a small journey with him to help him purchase an old Honda he wisely chose his mate Przemek, a trials champion and owner of Wena Moto a full service motorcycle shop. 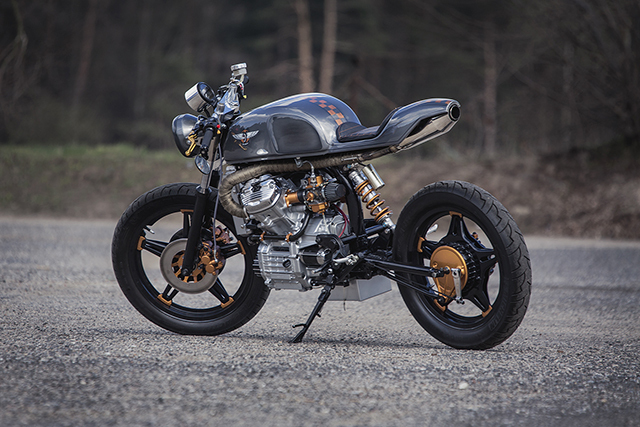 It must have been a hell of a trip because they returned with seven CX500’s and the idea for Wena Customs, a new outlet for one off custom builds, focussing largely on the quirky V-Twin Honda and bringing Prezemek’s tremendous knowledge of suspension to the custom scene in Poland. Born out of this friendship turned business venture is “Twister”, the stunning CX that sits before you and is a stunning sign of what’s to come. Wanting to display their suspension know how the decision to go to a mono-shock setup was a quick one and the sturdy frame of the CX is more than well suited. The frame has been smoothed out, all the collector tabs and other assortments cut free and the swingarm and frame given new shock mounts for the conversion. 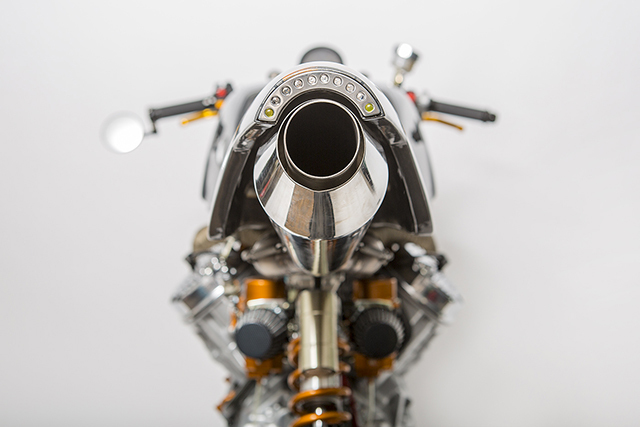 The bare engine was then fitted up to the frame, the swimgarm attached and measurements taken for the suspension components themselves and the fabrication work that was to come ensuring that clearance was available exactly where they needed it. 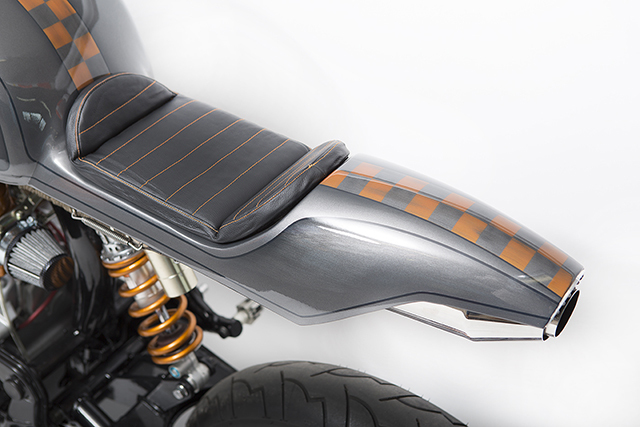 With everything triple checked the frame and swingarm were sandblasted before receiving a new lick of paint while the engine was given a less abrasive soda blasting treatment on all the exposed surfaces. 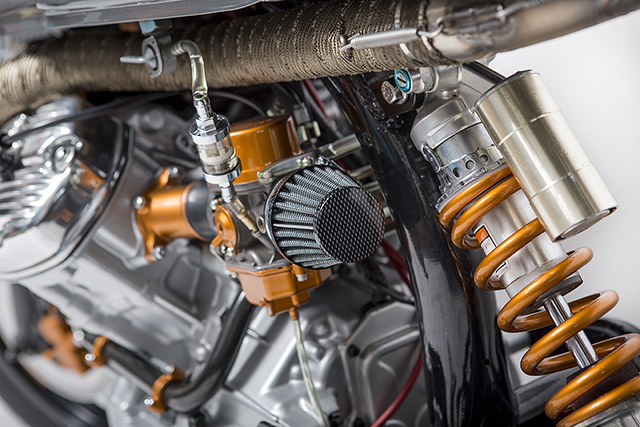 With the engine on the bench the all important suspension was fitted up with a fully adjustable, remote reservoir rear shock allowing Przemek to fine tune the ride as the build progressed. The front suspension is rebuilt and there is nothing wrong with standard telescopic forks other than their inherent want to flex and this has been rectified with a bulky set of custom triple clamps. The top clamp does away with the standard items riser mounts for a clean finish and a new set of clip-ons brings the rider down into a full racer position. With the engine now rid of decades of grease it was pulled down with the internals receiving a full rebuild before the short-block was bolted back together and then being painted and polished. 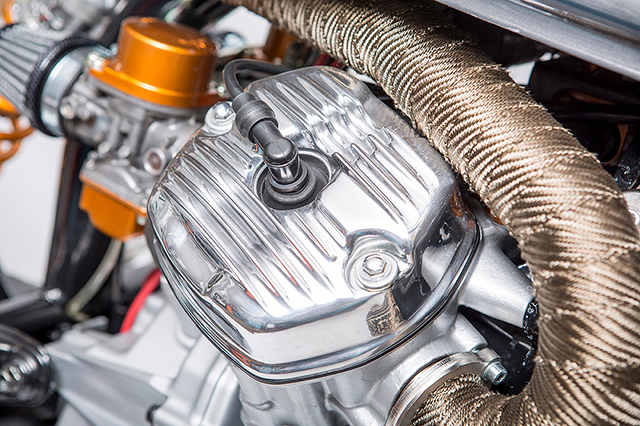 The standard Keihin carbs have been rebuilt and now breathe through pod filters while a number of larger jet sizes were kept on hand for what was to come. 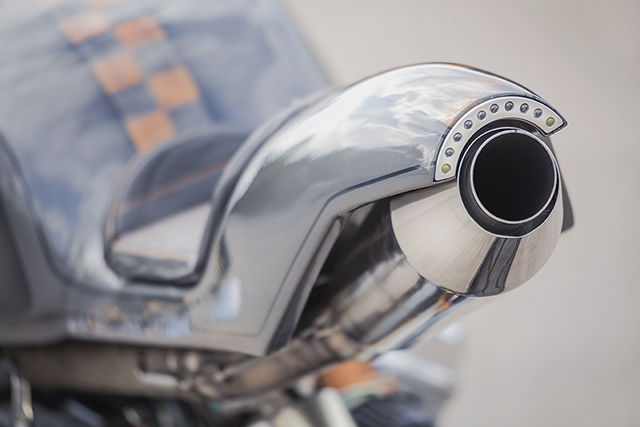 With the mono-shock setup comes the chance to keep the rear end of the bike entirely clean, so a custom fabricated 2 into 1 exhaust system was built that runs under the seat and exits at the tail with a polished stainless muffler that sounds a treat. The carbs were then re-jetted to suit the extra airflow and new rubber and cooling lines added as Polish winters hadn’t been kind to the old ones over the years. 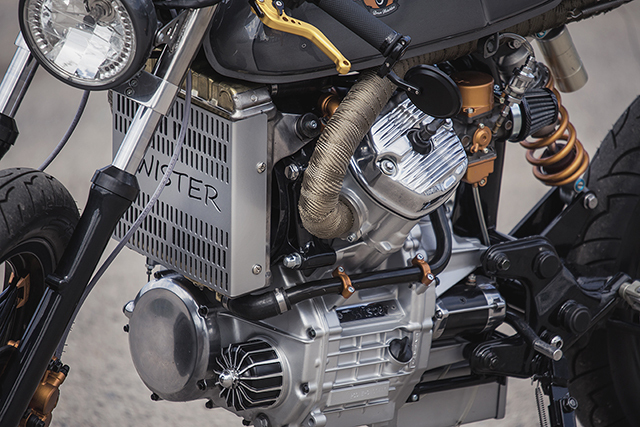 The radiator wears a custom shield featuring the bikes name while a machined oil filter cover and polished clutch cover give the longitudinal twin the appearance it deserves. With such a mechanical masterpiece coming to life they couldn’t leave the visuals anything resembling the stock CX appearance and it’s a model that needs a clever eye for the right design. With bold colours and traditional Cafe body work having been done before they returned to a trend of the ’70s with a beautiful single piece design. Taking the standard tank and shaping it to their liking they then crafted a seat base and tail piece that would be body worked into a single element with the tank. Given the canvas they had to start with the lines are picture perfect, a neat parallel line running the full length of the bike and showing off the iconic CX engine works brilliantly. The paint work is just as good with a combination of platinum silver and ghosted grey to pick up the smooth lines of the metal fab, a central race stripe of chequered orange and grey, with the new companies logo on each side so you know just who built this bad boy. To finish it off the gas cap is a neat conversion to a pop up unit so as not to disturb the lines and the lucky rider of Twister sits on top of a hand made leather seat with paint matching orange stitching. Seated in style the rider now rests their feet on R1 style rearsets mounted further back than the stock location and doing away with the nasty big Honda items. Up on the new clip-on bars it’s all business with modern switchblocks, a billet push-pull throttle and bar end mirrors to see just how many other bikes you’ve left in your dust. 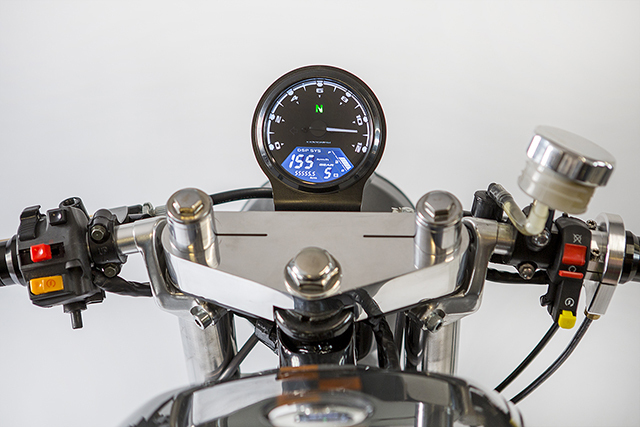 The single speedo/tacho combo sits in another hand made piece of metal work and rests above the new headlight with integrated LED turn signals. Not wanting to clutter up the rear small LEDs are frenched into the rear section to act as a tail light and tiny indicators, all displayed in a neat polished housing. To add some more colour to the project the wheels were sandblasted before receiving a coat of black with orange highlight and this theme was then extended across the build. 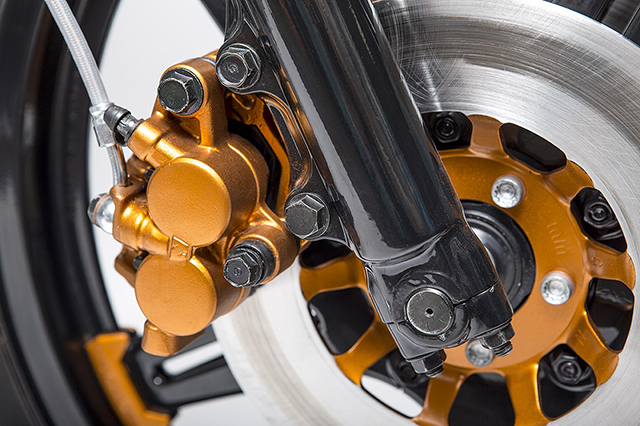 The inlet mounts, float bowls and carby tops were given the same taste of orange that was then applied to the spring on the new rear shock. The brakes have been totally rebuilt front and rear, including the addition of a new master cylinder and colour matching levers that have increased feel thanks to braided lines throughout. 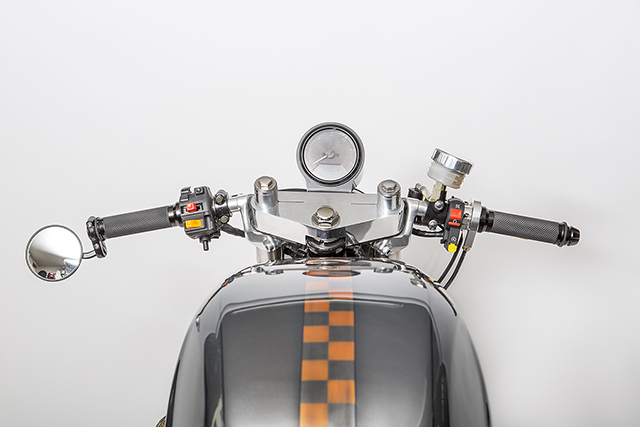 With the bike looking so good the standard wiring couldn’t be left in full view so the team underwent a full rewire of the Honda, added the appropriate resistors for the LEDs and then where the old chunky collector box once sat fabricated a new piece to hide the battery. 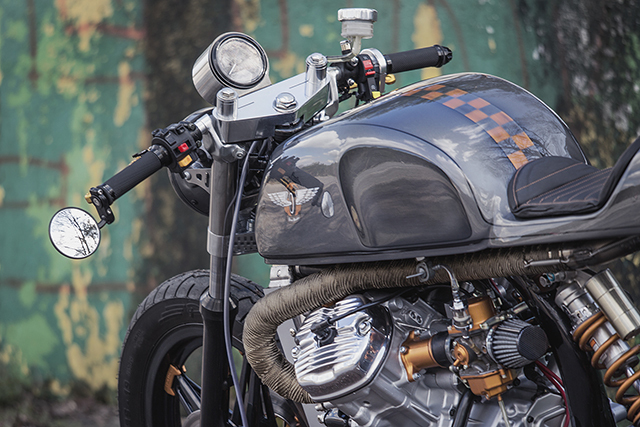 But not only was the finished product so good that the Wena Customs team picked up top cafe racer at the show in Poznan but when the main prize was announced they also took home 3rd place overall in the category sponsored by industry giants Custom Chrome. It’s more than enough recognition for the team to know they are on the right track and with the trophies come more orders for crazy custom CX500s. For Andrzej it is a dream come true and his friendship with his team only gets stronger and with Przemek by his side customers can be assured that their builds will go as well as they look and have the back up of a successful racer. 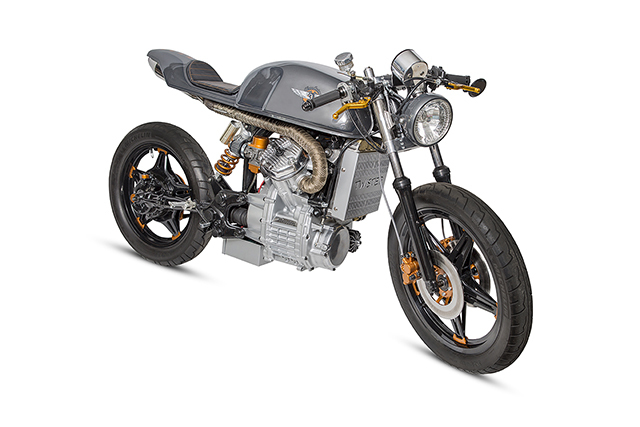 There really can’t be much better feeling than having built a bike that looks so good it wins trophies at a show and to then climb aboard and it rides and handles to the satisfaction of a man who made his name in the tough world of trials. 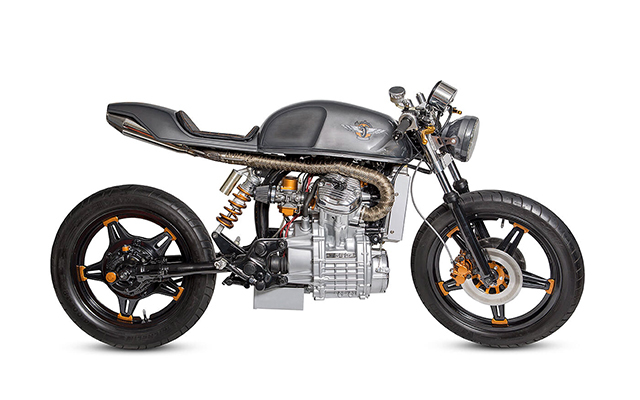 But Wena Customs have delivered exactly that and the Polish streets are ready to rumble to the sound of a very different V-Twin.